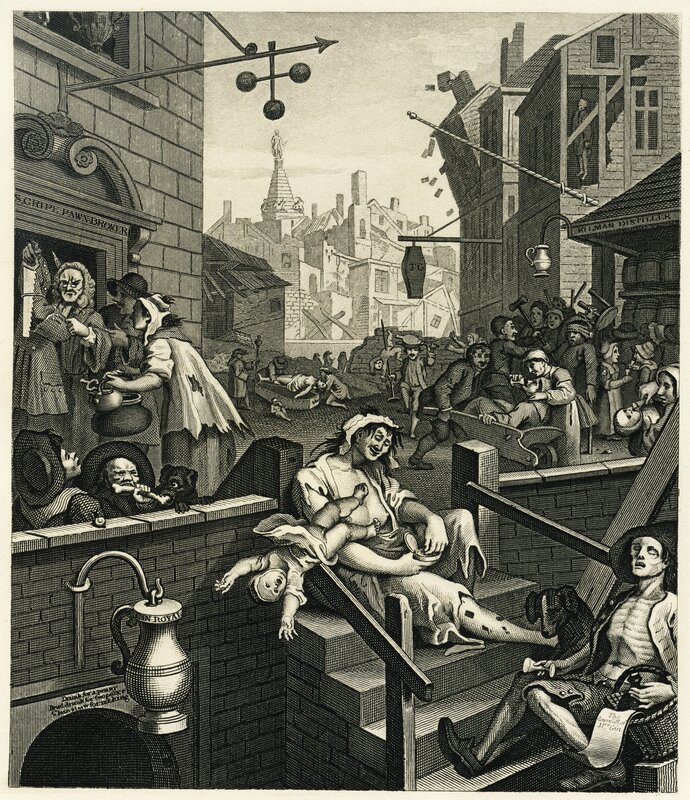 When the English artist William Hogarth produced his infamous engravings of prosperous “Beer Street” and chaotic “Gin Lane” in the mid-18th century, it reflected efforts to control London’s supposed gin crisis. Gin consumption had risen from very little at the beginning of the century to 19m gallons per year by the 1750s, and many people had become alarmed. One of the most striking images of “Gin Lane” is a partially undressed woman smiling as she carelessly drops a small child onto the street far below. Men are depicted as engaged in acts of violence or slumping helplessly after losing their jobs from drinking too much gin. Over 250 years later, the media still portrays the drinking behaviour of women and men very differently. We encountered this first hand a few years ago when we published research on gender differences in alcohol-related deaths in Scotland. The press release clearly stated that over twice as many men died from alcohol misuse every year as women. Yet the newspaper coverage included headlines such as “New booze death map shame of Scottish women”, accompanied by images of slumped women clutching wine glasses. We see this kind of thing again and again in the media – so don’t be surprised if the New Year coverage conforms to type. Perhaps one of the most reproduced images in UK newspapers for virtually any story about alcohol consumption is “bench girl”, a photograph of a young woman in a short black dress sprawled semi-conscious on a street bench. We decided to conduct a large study to see how differently men and women’s binge drinking is portrayed in the media as a whole. From a search of seven widely read UK national newspapers and bbc.co.uk, we identified 308 articles about binge drinking published over two years. When we analysed them, we found what we suspected: news articles associate binge drinking with women more frequently than men, and present women’s drinking as more problematic. Just like Hogarth, men are more frequently represented as violent or disorderly while women are characterised as out of control, unfeminine, under-dressed and undignified. News articles tend to present men’s drunken aggression as a danger to others, while women are characterised as putting themselves at risk. We found a strong emphasis on the deterioration of women’s physical appearance and attractiveness due to alcohol. Terms such as “ravaged”, “ruined” and “haggard” are used to describe the physical effect of alcohol on women, while “scantily clad”, “half-naked” and “nearly bearing all” describe their clothing. The few articles which mention men’s lack of clothing link this to loutish behaviour. They don’t suggest a lack of masculinity to parallel their depiction of women, nor do they take the same moralistic tone. Researchers have previously said that newspapers depict young women as “the public face of binge drinking”, and our research certainly backs this up. Yet the evidence suggests something quite different. The most recent figures for England showed that 19% of men reported drinking over eight units of alcohol on at least one day in the last week compared to 12% of women drinking over six units (these are the common measures for binge drinking). Men are also more likely to drink than women, more likely to drink heavily, more likely to drink more often and more likely to die from alcohol-related causes. While it is true that the gender gap in alcohol consumption is narrowing both in the UK and elsewhere, one side is still way out in front. By distorting the truth, people might think binge drinking is primarily about young women and mainly threatens your appearance and not your long-term health. This may encourage men and older people in particular to think of themselves as responsible drinkers who don’t need to question their own drinking. Articles and images of drunk young women may reinforce gender stereotypes which should be challenged – the double standards that allow women to be more harshly judged for drunken behaviour than men, for example; and sexual assault victims being seen as “asking for it” if they were drunk at the time. Finally, alcohol is more freely available, more affordable and more heavily marketed in many countries today than it has been for decades. The best evidence suggests that to reduce alcohol-related harm, people in charge of policy should reduce its availability, increase the price and control the marketing. If the media continually focuses on a particular group in particular contexts like public places in city centres, we may lose sight of these structural drivers of alcohol harm. If we want to get to grips with our drinking problem, a 1750s-style moral panic is not the way to go about it.